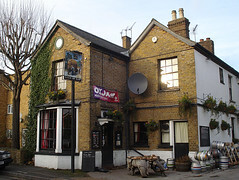 The Load of Hay was a pub in Uxbridge. According to the June/July 2018 London Drinker, it has now closed and the future of the premises is "uncertain". It's a lovely old-fashioned pub, serving real ale, and quite off the beaten track. The nearest station is Uxbridge, about a kilometre away; you're right at the edge of London here, as the M25 is only a little further. It's quite close to the Brunel University campus, so one might suspect a reasonable amount of student custom in term times. The student connection might explain one feature not normally found in this type of pub — a sushi bar (Gon Sushi) which also serves hot Japanese and Korean food. As of December 2014, this is open lunchtimes (until 2:30pm) Tuesday-Friday and evenings (6pm-11pm) Tuesday-Saturday photo of menu. Standard pub food is also available. The interior is full of character, with low ceiling, exposed joists, bare floorboards, a real fire (which we saw being cleaned out on our visit), church pew and low stool seating, and old pump clips stuck up wherever there's space photo. Guest bottled beers and ciders are listed on a board on the wall alongside several rows of bookshelves. The books themselves are provided for customers to read, and a sign mentions that although people are free to take them home to finish reading them, they should bring them back afterwards! Further back past the bar is another room with more seating and a bar billiards table. The sushi bar is also located in this section. There's a beer garden too. Kake visited on a Thursday afternoon in December 2014. There were three real ales on: Vale Brill Gold, Bowmans Swift One, and VPA Portobello. A mug of tea (made perfectly to my exacting requirement of "very weak") was £1.20. Service was friendly and welcoming. There was no music playing, but a TV was showing a BBC2 documentary with the sound on. Accessibility: A step to get in, and another step to get to the service side of the bar and the back room (where the toilets are located, including an accessible one). Last edited 2018-06-04 14:27:07 (version 14; diff). List all versions. Page last edited 2018-06-04 14:27:07 (version 14).